In addition to being the new home in 2018 of Elon Phoenix Volleyball, as well as Men's and Women's Basketball, the Schar Center will be the premier gathering space for the Elon University community and surrounding region. Schar Center will be the largest facility on Elon's campus, providing a venue for convocations, speakers and other major campus events. The 160,00-square-foot arena includes a spacious entry atrium and a large practice gymnasium featuring two basketball courts and three volleyball courts as well as a viewing mezzanine. The new team locker rooms feature state-of-the-art designs and workmanship, and the facility boasts a welcoming hospitality room for social events and gatherings. The arena's 5,100-seat capacity is triple the size of the previous home of the Phoenix, Alumni Gymnasium, and will not only be on par with the size of facilities at other member schools in the Colonial Athletic Association but will also stand out as one of the premier facilites in the conference. The facility is named for Elon parents Dwight and Martha Schar, who have contributed $9 million to the project. The university purchased the land for the facility with financial support from long-time Elon benefactor and alumnus Furman Moseley '56 and his wife, Susan. Take Interstate 85/40 to Exit 140 (University Drive). From southbound I-85/40, exit right and turn right. From northbound I-85/40, exit right and turn left. Stay on University Drive for approximately 4.5 miles. You will go through mulitple stoplights and cross over a bridge/overpass before reaching a light with Shallowford Church Road on your left and Williamson Avenue on your right. TURN RIGHT ONTO WILLIAMSON. Go approximately 0.2 miles. 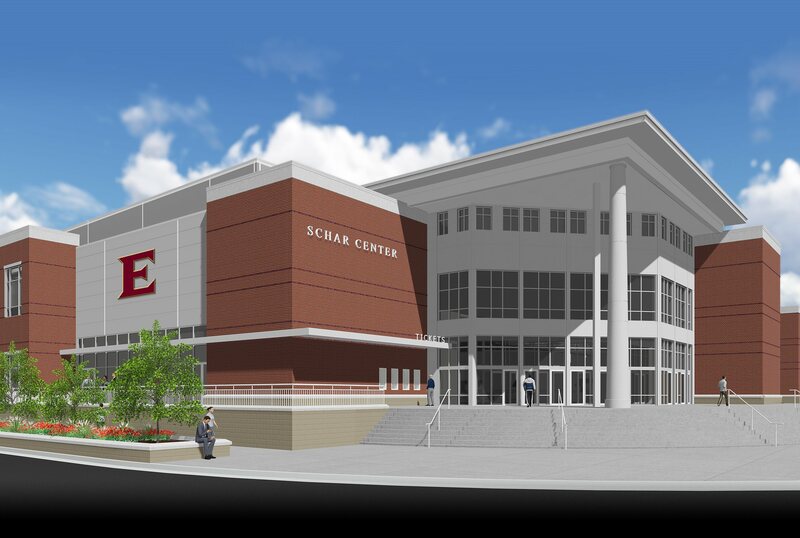 Schar Center will be on your right with the large E logo (across the street from the football and baseball stadiums). If you pass the softball lot on your right, you have gone too far. There is parking in front and behind the arena. To get to Alumni Gym from Schar Center, simply take a right (head south) onto Williamson Avenue out of Schar Center lot. You will pass Lake Mary Nell on your left as well as the Center for Fine Arts. You can park in the lot on your left directly next to the Fine Arts Center or in the Oaks Lot to your right which is across the street from Alumni Gym. Alumni Gym hosted Phoenix Volleyball for the last time in 2017 before the team moves to its new home in Schar Center just down the road from historic Alumni Gym. In recent years, Alumni Gym underwent renovations which included the addition of stadium-style seating in a horseshoe shape around the court. The updates also included new scoreboards and video boards along with new locker rooms and a new entrance at the south end of the facility. In thanks for a generous gift, the playing court was renamed Robertson Court. Alumni Gym has played host to many notable games throughout the history of Elon basketball. On February 27, 2010, 1,934 fans packed the facility to watch the Phoenix men battle Davidson in a double-overtime thriller. On February 28, 2004, the Elon men defeated rival UNC Greensboro 112-108 in a triple-overtime contest. 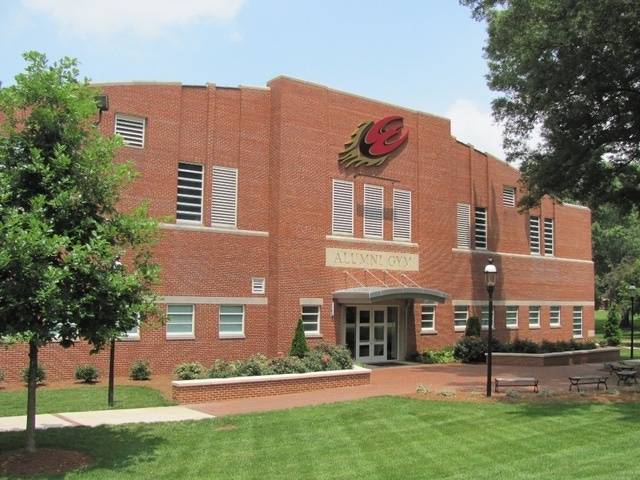 On the women's side, the Phoenix hosted the first postseason tournament ever inside Alumni Gym in 2011 when Elon welcomed USC Upstate on campus for the first round of the Women's Basketball Invitational on March 17. The Phoenix did not disappoint, claiming a 103-72 win. On Feb, 19, 2011, the team hosted Samford in front of a record-crowd 1,071 fans for its Pink Zone game. The retired jerseys of Jesse Branson ('65) and Tommy Cole ('72) hang from the Alumni Gym rafters. Branson is Elon's all-time leading scorer, having netted 2,241 points in his career. Cole ended his career in the maroon and gold with 2,214 points, ranking second in program history. Alumni Gym, also the former home of Phoenix Volleyball, used its final 2017 season to help the program finish with its best home record (11-5) in the CAA, which propelled the Phoenix to its first-ever birth in the conference tournament. In 2017, Alumni Gym hosted multiple other firsts for the program, including CAA wins over UNCW and Hofstra, as well as the program's first CAA weekend sweep of Hofstra (in 5 sets on November 3) and Northeastern (in 3 sets on November 5) for Senior Weekend. As the long-time home of Phoenix Volleyball, the gym has also seen the program compile its best record at the NCAA Division I level in 2009, going 23-8 on the season. In 2010, the Phoenix secured a share of its first SoCon North Division crown by defeating Appalachian State 3-0 on November 12 before claiming the title outright with a 3-0 victory over Western Carolina the next day. Take Interstate 85/40 to Exit 140 (University Drive). From southbound I-85/40, exit right and turn right. From northbound I-85/40, exit right and turn left. Stay on University Drive for approximately 4.5 miles. You will go through mulitple stoplights and cross over a bridge/overpass before reaching a light with Shallowford Church Road on your left and Williamson Avenue on your right. TURN RIGHT ONTO WILLIAMSON. Go approximately 0.6 miles. You will pass Schar Center (large E logo) on your right. You will pass Lake Mary Nell on your left as well as the Center for Fine Arts. You can park in the lot on your left directly next to the Fine Arts Center or in the Oaks Lot on your right which is across the street from Alumni Gym.